This year marks the 20th year of operation for Aperion Audio! Two decades ago when the internet was in its relative infancy, we were born as a pioneer of online direct-to-consumer speaker manufacturing. Realizing the disparity in cost vs performance in the industry, we focused on a quality customer experience that offered a better value, meaningful information, and generous service. 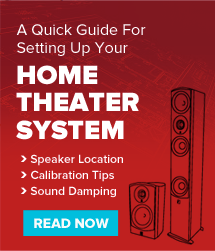 The philosophy of “cutting out the middleman” has allowed us to create an incredible sounding speaker at a price that is far lower than any comparable product. This combined with the ability to build a direct relationship with our customers allows us to immediately absorb their feedback and drive the company in a direction consistent with the needs of the most important decision maker, YOU. 1999 – February 1999 Aperion began life as Edge Audio, entering the market with the 502D system. The original speakers were manufactured in its factory in Ensenada, Mexico made of solid capirona wood, available in two finishes, cherry and walnut. The 502d speakers contained a vifa 5.25” mid and 1” silk tweeter and the “Diaural” crossover. To compliment the edge system, a single 12” sub was available. 2001 – Edge Audio is changed to Aperion Audio. That date also marked the end of 502d and the beginning of 2nd generation 512 bookshelf. The speaker contained the same driver and tweeter as the 502d, however, because of some defects with the capirona wood, the cabinet was switched to 1” HDF (high density fiberboard) and made available in cherry veneer and black lacquer. Manufacturing was moved to China. 2002 – Next in the Aperion lineup came the new and improved 3rd generation 522 bookshelf speaker and introduced the “Intimus” family name. The new speaker was an almost complete revision of the 512. Switching from vifa drivers, Aperion now had its own in-house custom designed drivers and amps manufactured from the same Chinese vendor. The 522 was redesigned to a slightly larger size. Along with a new woofer and tweeter, the DiAural crossover was re-tuned to give the 522 a much warmer sound. Another sub was added to the series, the S10 with a front firing 10” woofer and a 200-watt amp. 2005 – Aperion added some smaller speakers, the 422 bookshelf and 422c center speaker, matched with an 8” 100-watt sub. Also, some larger bookshelf speakers were added for the music enthusiast, the 632LR. This was a 6.5” carbon fiber woofer with 1” silk tweeter and the new HD-X3 crossover. Finally, the 633T tower speaker with two 6.5” woofers and 1” silk tweeter was added to the Intimus series, giving a multitude of speaker options for all music and home theater needs. 2008 – A revision of the Intimus line was initiated with a slightly changed aesthetic look, but a major change in terms of build and sound quality. A new tweeter was designed along with the move to cast aluminum frames for the woven fiberglass woofers. The Intimus line was renamed based on driver size, with centers, towers and bookshelf in either 4”, 5” or 6”. To fill out the 6 series line up, a home theater enthusiast 6C center was added along with a 5T tower speaker. At this time the 533PT was also retired as the 633T quickly became the flagship speaker in the line. 2009 – After the Intimus revisions, Aperion launched the new line of Bravus subwoofers. The first version had dual active 8, 10 or 12” woofers along with DSP, a powerful class D amplifier and remote control. Over the next year Aperion added architectural speakers, bringing on an Outdoor Speaker and an LCR in-wall speaker to compliment the 6” in-wall and in-ceiling designs. 2010 – Aperion set out on designing a new and improved speaker line. One that would build on the success of Intimus but bring all around audiophile sound and design at a value price that was unprecedented in the audio market. Launched at the 2010 Rocky Mountain Audio Fest, the Verus Grand Tower speaker was an instant best of show and customer favorite. In the Verus Grand line, a Grand Center and Grand bookshelf were offered to complete the system. The Verus Grand series drastically changed the design aesthetic of the traditional square Intimus look to a more refined, higher end glossy curved cabinet. In addition to the design, Aperion also developed new Kevlar woofer and a patented tweeter ASR that set Verus apart as a true audiophile speaker. 2011 - A Bravus subwoofer redesign was completed moving to a single down firing active driver matched with a pair of passive radiators and larger more powerful class D amplifiers. Mid 2011 also brought the arrival of the smaller Verus Forte line of speakers and a Verus Surround Speaker. Following in the footsteps of Verus Grand, the Forte line has won numerous awards and accolades alone with customer raves. 2014 – This saw the release of one of our most popular speakers ever – the Allaire Bluetooth speaker. The easy connectivity and awesome sound quality was a hit with reviewers and customers alike. 2015 – After five years of accolades, we couldn’t leave well enough alone. Verus II emerged at the end of 2015 with a slew of refinements for our flagship speaker line. A redesigned crossover network and further enhancements to our patented ASR tweeter highlighted a range of improvements. 2018 – Being a perfectionist is never easy. New performance enhancing features were developed for our Verus family which instigated another step in our evolution, Verus III. The added flexibility of the TrebleMod feature and driver improvements propelled the sound quality above anything we’ve ever made. Also, the Super Tweeter made its debut. This little add-on speaker has far exceeded our expectations and has continually sold out faster than we can make them. 2019 – The Outdoor speaker returns! More new products…?? ?